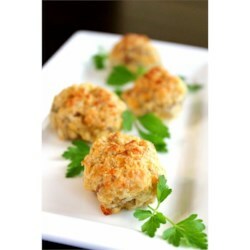 "Biscuit mix, pork sausage, Cheddar, Parmesan and parsley are mixed together to make these savory and crowd-pleasing sausage balls." Preheat an oven to 350 degrees F (175 degrees C). Grease a broiler pan or other pan with rack. Mix together the baking mix, sausage, Cheddar cheese, Parmesan cheese, milk, and parsley. Shape the mix into 1-inch balls and place on the prepared pan. Bake the sausage balls in the preheated oven until brown, about 25 minutes. If you do not have a pan with a rack, you can bake them on a pan with raised edges, and drain them on paper towels before serving. If balls are too mushy to hold shape on rack, add more biscuit mix. For bolder flavored appetites, try hot sausage and/or sharp Cheddar. I've been using this recipe for years! My husband got it from a former co-worker after she brought them in one day. They are delicious served with fresh Ranch dip! Too dry and bland with regular sausage, will try a spicier sausage next time. Made these for a New Years party and they were gone before the clock struck 12. Super easy to make and everyone loved them. I wonder if I could make these Gluten Free next time. I'll give it a try. I used 2 lbs. of sausage instead of one. I liked the extra meatiness and not so much potato.